After knowing about each other’s destinations, we got engaged in a long conversation about life, work and killing spree for seats in Violet line at Central Secretariat until his station did not arrive. There is one thing I have noticed, in the whole conversation, there was a constant bright smile on his face and zeal in his attitude. It might be because of our first meeting. In a few days, our friendship grew and we became good friends. We used to wait for each other, and then go for massacre for the seats in Violet Metro, together. And then as usual we talk about office, life and everything that is going on. He told me very bit about him. How his parents died when he was only eleven, and how his grandmother has gone through all hardship to raise him and his sister, and how he is working in my office to help his grandmother, and to save some respectable amount for his sister’s education and marriage. He is also pursuing Bachelor’s degree from Delhi University’s SOL. Though that simple reply shook me from my inner core. Because, we usually kneel down to our circumstances and accept them as our own destiny. 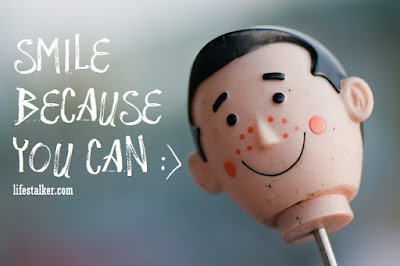 In reality, the answer lies in challenging the circumstances with a sweet bright smile. And everything really did not matter if you know your work and you have some good friends. We are born with a quality to fight against the hardship in our lives with a bring it on attitude. But, we have forgotten this quality over period of time. You can observe this quality in a child who is learning to walk, whenever he falls, he gets up and tries to walk again. With his strong desire to walk and after many falls, he learns to walk on his two legs. Meanwhile, whenever he falls for a minute or two, he cries but he smiles every time when he gets up. And that’s how he wins. Smile energizes your soul, and provides you energy to live life, and take on the hardship. So Smile! Because You Can.